Don't really know a lot about Malaysia yet. I've been to the capital Kuala Lumpur a few times and enjoyed exploring it. It's an interesting melting pot of different cultures from around the world. 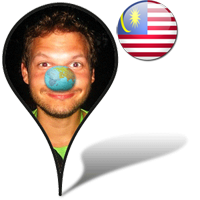 Kuala Lumpur is also the start point for my Tandem Bike challenge. Click the pins on the map for more information about that place. I'm building this map 1 pin at the time. HI this is Elaine, we met at Hee Hong Cycle and did the Earth Hour Ride together after Hee Hong build your tandem. I have already send your details to Hong Kong's bicycle groups for them to contact you. Pls provide us with your email. find your pictures and upload onto your blog ya =)Ride Happy Ride safe and hope to see more epictures with your around the world stories ya. My Blog but only very basic as I am still playing and learning how to make it more interesting to build followers base.